Universal serial bus (USB) technology is nothing new—first introduced in 1995, it has since become ubiquitous in a wide array of consumer products that now have a USB connection. The original rationale for USB was to provide a replacement for legacy ports on a computer and make adding peripheral devices quick for end users. Some of these peripherals include mice, printers, telephones, keyboards, modems, scanners, video cameras, storage devices, audio devices, and digital still-image cameras. The growth rate of USB has been remarkable. Market research firm IDC indicated in a report, 'Worldwide Interfaces and Technologies Embedded in PCs 2010-2014 Forecast,' that the 2011 USB installed base is 10+ billion units worldwide and growing at 3+ billion units annually. IDC said adoption is virtually 100 percent in PCs and peripheral devices. Over the years there have been a number of versions of USB specs released. Revision 1.0, rolled out on Jan. 15, 1996, showcased a low-speed transfer rate of 1.5 Mbit/s and a full speed transfer rate of 12 Mbit/s. Key feature of Revision 2.0, announced on April 27, 2000, was adding a high-speed transfer rate of 480 Mbit/s. More than eight years later—Nov. 17, 2008—Revision 3.0, was introduced, which brought a number of performance enhancements to the USB standard while simultaneously providing backward compatibility for peripherals still using Revision 2.0. The USB-IF has already certified more than 200 new USB 3.0 devices. Two examples include the first standardized USB 3.0 flash drive from Imation; and the ASUS O!Play HD2, the interface's first USB media player. In fact, according to the USB-IF, a number of leading technology firms are expected to make significant USB 3.0 inroads by the end of 2011 and leading into Q1/2012. This is being accelerated by the narrowing price difference between 2.0 and 3.0 ICs. Renesas is on track to ship more than 72 million USB 3.0 host controllers by the end of 2011. GIGABYTE estimates it will ship 7.5 million USB 3.0 motherboards by the end of 2011. AMD recently announced the first certified USB 3.0 chipset. VIA Labs has recently certified 2-port and 4-port host controllers. Host controllers are usually added to motherboards and suppliers include Via Labs, Fresco Logic and Etron. Device controller ICs are also experiencing sharp competition among vendors including Genesys Logic, Fujitsu and in the U.S., Symwave and Texas Instruments. As USB 3.0 deployment continues, vendors continue to unveil various products to help verify the accuracy of USB 3.0 designs. Last year, for instance, Synopsis debuted its DesignWare USB 3.0 Protocol Analyzer, a graphical debugger that helps engineers verify USB 3.0 and 2.0 interfaces in their systems-on-chip (SoCs) by providing a graphical view of protocol traffic. This helps users identify design traffic patterns and they can then switch to a detailed view of packet information. Another company, Total Phase, which provides various embedded systems tools, has been marketing its Beagle USB 5000 SuperSpeed Protocol Analyzer, a real-time USB 3.0 bus monitor. The analyzer captures/displays USB 3.0 data in real-time and supports Windows, Linux and Mac OS X. So will USB 3.0 continue to grow in popularity? Yes, but there may be a possible speed bump. Intel's Thunderbolt, introduced last February, is a high-speed interconnect technology developed by Intel and Apple that transfers data between computers and externals devices at up to 10 gigabits/second. PC makers Acer and Asustek Computer plan on delivering Windows PCs in 2012 with Intel's Thunderbolt interconnect —so widespread adoption could grow. Rob Enderle, who heads up market research firm The Enderle Group, added that Thunderbolt and USB 3.0 fall into two classes. "Thunderbolt is a super port that can connect to a hub and also passes through an HD display interface," said Enderle. "In an ultra-thin product like a Macbook Air or Ultrabook (from Dell), it should be preferred because the port real estate is so limited. Right now there aren't that many Thunderbolt accessories and only Apple has adopted it widely. USB 3.0 is best for storage or video capture and can be connected through a Thunderbolt hub. Thunderbolt likely will be a huge differentiator for thin notebooks but doesn't really do much for desktop computers yet because they typically don't need hubs. " USB 3.0 may also change the security space. Ed Moyle, principal analyst with Security Curve, said the increase in transfer speed is likely to make folks want to update existing USB storage. "Given the new/better options for data encryption, that change could be a good opportunity for organizations looking to add that functionality—if they're provisioning USB storage, they might now choose to select a product that has onboard encryption capability at the same time," said Moyle. Tom Starnes, senior analyst for Objective Analysis, added that the USB design itself is cumbersome—what he calls "awkward compatibility." "The shoulders on some USB plugs and devices prevent insertion in some devices and if you try to stack them or put them in too tight a space, then they don't fit—kind of the reverse problem of the HDMI connector," said Starnes. Lastly, Mike Feibus, principal analyst for TechKnowledge Strategies, added that although USB 3.0 doesn't offer as much bandwidth as Intel's Thunderbolt, it will help PC makers trim the number of ports they supply in notebooks—an important development as the industry continues to develop thinner, sleeker models. Despite some caveats then, look for continued USB 3.0 market adoption. Market research firm In-Stat estimates 77 million USB 3.0 products will be sold this year; 436 million by the end of 2012. "These new solutions will help contribute to the overall expansion of the SuperSpeed USB ecosystem," said In-Stat Research Director Brian O'Rourke. There are a number of issues related to delivering power over a USB connection. 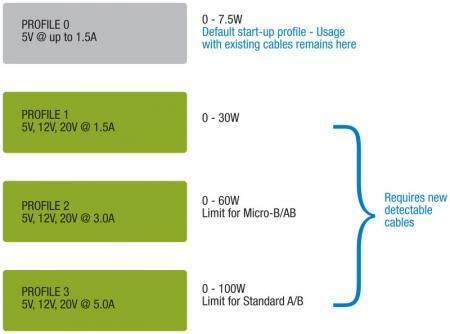 USB 1 and USB 2.0 do have a limited power delivery ability to deliver 5V at ±5% over a single wire in the cable. When connected to a computer, for example, the current available is limited to what is known as a "unit load," which for USB 2.0 is 100 mA and for USB 3.0 150 mA. More than one unit load may be available, up to 500 mA if that amount of current is available on the bus. In the case of USB hubs, there are two types: bus-powered and self-powered (i.e., with a separate plug-in adapter). A bus-powered hub supplies only one unit load to a device, although multiple devices on that hub can draw one unit load each, depending on the power supplied over that bus. A self-powered hub obviously has more current capacity and can supply the needed unit loads to the devices connected to it. For example, a high-power device like a disk drive would require more power than could be supplied over the bus alone. It could use a second USB cable to get the power it needs, but a more practical solution would be to connect it to a self-powered hub. With an ever-increasing number of mobile and handheld devices, such as smartphones and tablets, there is increasing attention on battery charging. There is a move to not only support charging battery-powered devices but also to run devices requiring higher power in a seamless and unified environment. To this end, the USB-IF has been supporting the development of charging standards with the recent adoption of the USB battery charging 1.2 specification. This will enable up to 7.5W (1.5A @ 5V) and provides a standard target for the design of chargers for mobile devices. The mobile phone industry has also taken an initiative by moving to support the use of a micro-USB port as a common connector for charging phones. While that in itself is only a step toward a universal charging scheme because it does not specify all needed aspects such as input power, etc., it has led to a large consortium—the GSM Association—to agree on a standard charger for mobile phones. Subsequently, the European Commission came to an agreement with manufacturers for an external power supply for charging phones sold in the EU. This, in conjunction with the battery charging 1.2 specification, means that future chargers will be "one fits all" and users will be able to use the same charger, which will carry the USB symbol, for any new phones, greatly reducing the number of chargers that will need to be manufactured, greatly reducing electronic waste. All this brings us to a new initiative that is building on the idea of standard battery charging and extending it to actual power delivery for devices of up to 100W. USB Power Delivery is a specification that is still under development and is expected to be finalized by the second quarter of 2012. Still, a number of its goals have been made public. The new Power Delivery specification will co-exist with USB 1.0, 2.0 and 3.0 as well as the battery charging specification, but will in addition have the ability to deliver power to supported devices up to about 100W. USB Power Delivery will have four different power delivery profiles (Figure 1). The default profile will be useable with existing cables up to 7.5W, which is also the level of the charging specification. For the other three profiles, there will need to be cables capable of carrying the increased power. The connectors will be given ID pins and pads that will tell the system the proper cable is installed. The negotiation process will start at 5V over the Vbus as usual. If ID pins are detected, then voltage/current adjustments will be made to match the host with the consumer device. Negotiation takes place over the Vbus as well without involving any data line usage. Thus higher power usage will be limited to known cables to eliminate the chance of accidents. In USB Power Delivery, source capabilities are organized as profiles. At startup, a negotiation process identifies the proper profile and checks to see that the proper cable is in place. Power Delivery enables one device, such as a display that is actually plugged into an AC outlet, to act at the power source and hub to hosts and other devices connected to it (Figure 2). A different device, such as a phone or a laptop, can then act as the USB host. In addition, the source of the power delivery can be switched without changing the cable direction. In this example, the display is in the role of the power hub while the phone is the USB host. Different configurations are possible independent of which device is the power source. Although USB 3.0 is currently aligned on 5 Gbit/s as the best option for cost and performance, the transaction and line protocols have been developed and analyzed for a minimum bandwidth of 25 Gbit/s. This leaves a path open for future speed and bandwidth extensions. However, such advancements—like most design decisions—will be considered against the need of applications for more bandwidth balanced against complexity, power requirements and cost. In the light of the proliferation of mobile and handheld devices, there are also activities underway to investigate enhancing power efficiency and extending battery life. In addition, enhanced protocol capabilities are being considered for things like security and the reduction of transfer latency in order to anticipate the possible needs of future applications. USB 3.0 is called SuperSpeed today, but that may have to be revised in the future. It has proven itself to be a dynamic and extensible interface and we have not yet seen all its possible uses and capabilities.